Intex Aqua V4 is a mix of good looks and affordability. It is a compact Android based phone that lets you have a basic smartphone experience at a low price. It comes with ample storage and average features. 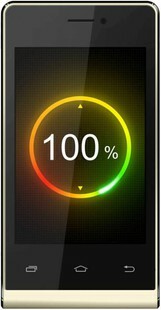 At the price of INR 2699, the Intex Aqua V4 it is a good buy if you are on a tight budget. The Intex Aqua V4 comes with a 3.5 inch screen with a 320x480p resolution. It is slightly bigger than a feature phone. But this makes it easy for people who do not like big screens. Powered by a 1GHz processor, the phone is integrated with 256MB RAM. This means you can only run one application at a time. You get 512MB of storage which can be expanded up to 32GB with a microSD card. At this price the storage is good enough. For imagery, you get a 2MP camera on the back and a VGA front camera. The 1200mAh battery will last for about 7 hours on a single charge. The Intex Aqua V4 comes packed with all connectivity features including 3G. So it isn't something out of the box, but what else can you expect for such a low price? Of course there are better options if you pay a little more. Intex Aqua V4 full specs and reviews as of Apr 2019. Buy it here!